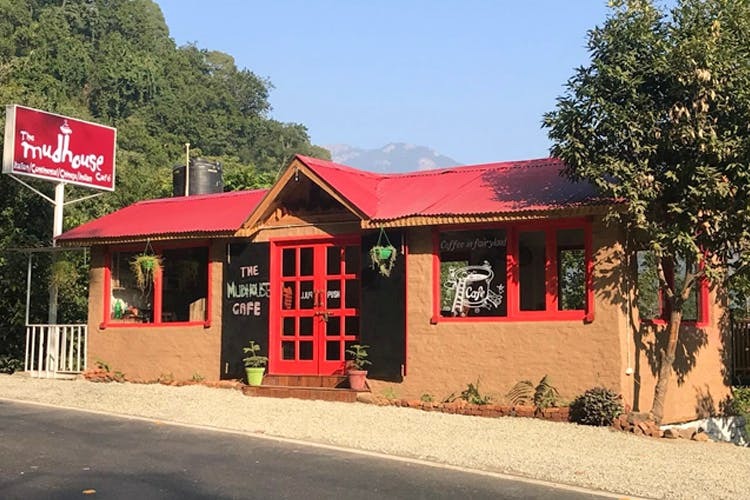 The Mud House Cafe is exactly the kind of picturesque pit stop that makes us dream of the hills. Complete with a bakery, live music and a rustic vibe with an actual mudhouse, they deserve a visit – even if it means a bit of a detour from your route. Very often, we realise that it’s not just how the place looks or how the food tastes that defines our experience, but also how the hosts make us feel. This place deserves a special mention for that. The couple that owns it will often stop by to check on you, while the staff will make sure they’re around without bearing down on you (and bae’s private little lunch scene). It’s plonked in the middle of a bay leaf garden, and if you grab a seat outdoors, you’ll have the lush forests forever in view. Doesn’t that make gazing at the hills and eating kebabs that much more fun and dreamy? The menu here, in typical mountain-style, is an assortment of Indian, Italian, Chinese and nibbles. Their blackboard menu keeps trying to switch things up with things that aren’t dal makhani (don’t worry, they’ve got that as well). Think boti kebabs, sauteed sausages, phirni, pizza, mutton ghee roast (yum), paneer tikka and a certain something called Singapore paneer. Team soya, they got your back too (with garlic naan dancing in front of our eyes). Did all that food make a solid case? Then refuel with coffee or start your journey right with their breakfast menu that has everything from an aloo puri platter to poha, and even the cutest fried eggs. You’ll definitely be sorted for the road after. Oh, and pack some desserts if you can. It’s 8km from Kathgodam and on the Nainital highway. This means the advantage of location with the mellow breeze and sunshine of the hills. Win-win for all!